Horrendous? Well it is sort of bland in the renderings (I heard Maki is a little behind schedule with the detailing but they didn't want to hold up the release to the public) but it is far, far, far superior to the 3 black boxes on Liberty St. so I'd hardly call it horrendous. 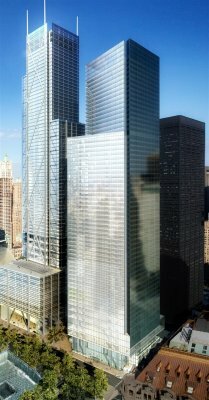 Its better the 7 WTC for sure also. I don't think its better than 7WT because we knew that it (7WT) wouldn't be anything special. As a matter of fact I felt that it was the ideal project for Childs because we didn't expect much and he gave us an exceptional mediocre box-tower and I didn't mind at all due to expectation. From my understanding these towers had to be iconic and follow some sort of spiraling pattern. This Tower 4 is a joke. That setback at 700 ft is horribly executed and it literally looks like cubes stacked on top of each other. Lame shape, lame flattop roof and way too tall for a tower of this bad-caliber architecture. Perhaps the finished product looks alot better, but after seeing what I saw (unless they change it dramatically) I doubt it. 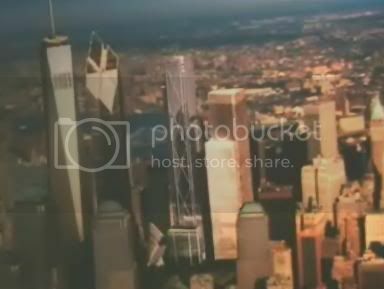 This tower could have pushed this whole complex over the edge and brought it up another level of excitement but this and the FT give it an anti-climatic presence of disappointment as opposed to the transportation hub, WTC2 and WTC3 in which you actually feel proud to have them built. All this of course IMO. A slope might make the building more interesting. However, the way you were mistakenly seeing it slope was down from south to north. If the roof was going to slope, I think it would look better the other way - down from north to south. I took a little more time to go over the renderings given for this tower today (I'm still on rendering overload). From what I've seen, this tower will have some of the best public space, including the restaurant overlooking the memorial. That atrium seems nice. I just think a tower this gargantuan needs a little more detail at the top. Something to distinguish it a little more. It will be one of the tallest in New York, yet you probably couldn't pick it out of a lineup. I like the view of the building from that angle, and from the base of the memorial. even though it could lose some weight. Definitely agree with the constructive criticisms of this tower. Reducing the bulk a little bit would make it soar (as Rogers realized in designing Tower 3), and doing something innovative with the crown - not anything flashy, just a nice "gesture" - would go a long way in completing this building. Right now, it really does look like a massing model. But will Maki come through? I've been getting the sense that he's way too committed to the minimalist approach to make those changes. Is this something that should have been foreseen? Last edited by lofter1; September 9th, 2006 at 02:29 PM. Nice ^^^ thanks for the link!